The term originated in Germany, and refers to the technique of working a horse with an excessively rounded neck, so that the horse's head is brought down and back towards it's chest, hence the alternative descriptions: 'hyperflexion', or 'low, deep and round' (LDR). The horse is held in this position by means of an extremely forceful use of the bit, usually the double bridle whose considerable leverage on the horse's jaw and poll permits the rider to use it to position the head down and greatly behind the vertical, and to hold it there in the equivalent of an arm-lock on the horse's neck. Sometimes other gadgets or 'auxiliary aids', such as de Gogues or Draw Reins, are also used to hold the horse's head in this position. In this way rollkur is often performed on the lunge as well as in ridden work. Why Do Riders Use Rollkur? Rollkur has developed as a training method, used by many of the most successful competitive dressage riders, because it results in higher scores in dressage competition, when the horses are returned to a 'normal' head carriage during the test. Rollkur's proponents claim that it raises the horse's back due to the leverage of the lowered neck on the spine, but in fact this is a totally artificial effect. It has nothing to do with the desirable lifting of the back which results from true engagement, and comes from the rotation or tucking of the pelvis, not manipulation of the front end. 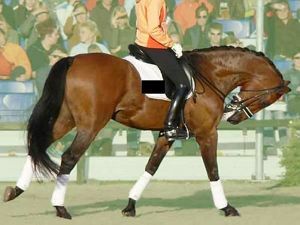 The real reason Rollkur is used by success-driven dressage riders, is that the high neck carriage required at the higher levels of competition, when created artificially with the bit, results in a hollowing of the horse's back, and this hollowing may become undesirably visible in the neck. 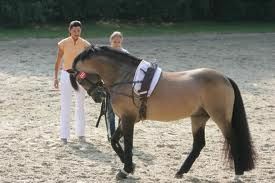 Rollkur is used to disguise this hollowing, because the horse is, for periods during training or warm-up, forced to maintain a consistently over-rounded neck. When the horse is subsequently returned to the high head-carriage (as in this picture of Anky van Grunsven and Salinero), the horse's neck keeps a rounder appearance (despite the hollow back which remains), and this is favored by the dressage judges. 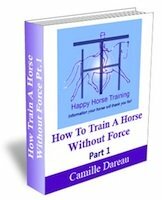 This is effectively a way of conditioning the horse so that, no matter how little transmission is coming through from behind, no matter how forceful the riding and stressful the circumstances, he must never raise his head above the bit. Another reason that the use of rollkur as a training technique results in more competition success is that it develops the particular neck muscle in the horse responsible for raising the forearm of the front legs. Again, when the rollkur trained horse is returned to the high head-carriage, this shortened lower-neck muscle (the M. Brachiocephalicus) pulls the forearm higher when it is lifted in movement. 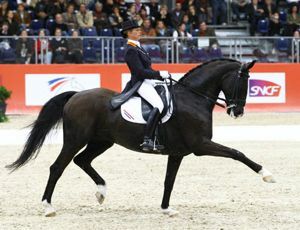 This high front leg action has become desirable as part of the spectacle that competitive dressage has become, despite the fact that it is completely counteractive to true engagement, because it accentuates the disconnection between the hind-leg action and the forehand. Some top dressage riders/trainers have also referred to using rollkur as a form of 'correction' when a horse is 'misbehaving', or as a way of gaining control of a horse who gets out of hand. In a way this is the most deplorable reason of all for riding in this way, when you consider that the whole point of dressage itself is to make the horse calm and controllable in any circumstance, even the chaos of battle - the original purpose of the discipline (see The Origins of Dressage Training). 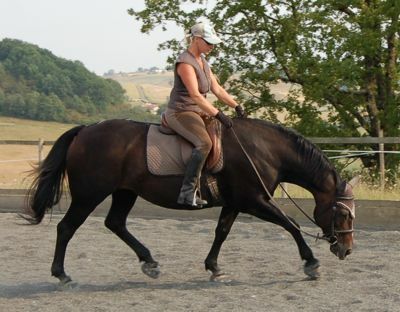 A rider who has to resort to such abhorrently forceful riding to remain in control clearly has not achieved any meaningful gymnastic connection with the horse through their training. The profoundly harmful effects of rollkur on the horse have been shown to be extensive, as would be expected from such a forceful technique (see Dr. Gerd Heuschmann's If Horses Could Speak, and the excellent in-depth exploration of the subject on the Sustainable Dressage website). But the point here is that for any rider that understands the nature of true engagement (which is supposed to be the foundation of all dressage) the discussion of the validity of rollkur does not even need to be broached. This is because the fact is that any independent positioning of the horse's head carriage, high or low, deep, round or anything else, is contrary to riding which promotes real engagement. A simple fact which is greatly ignored in much dressage training... hence the possibility for such an erroneous method as rollkur to have come into existence, let alone be practiced at the highest levels of the sport. When we ride for engagement, everything we receive in the contact is as a direct result of what is happening behind - i.e. the rotation of the pelvis, alignment of the hind-legs, flexing of the hocks, lifting of the back by the abdominals, not to mention the overall straightness of the horse which allows the forwards transmission of power from the haunches towards the bit. The positioning of the neck that the horse offers to the rider is crucial feedback on what is happening in the rest of the horse's body. Like the receiver on a phone line, to establish good communication with the horse, we need this feedback to be as clear and as true as possible. We above all do not want to disguise it by artificially altering the horse's head carriage with the bit. 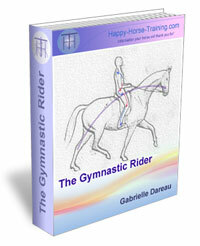 Any independent action of the rider's hands on the bit that influences the neck position breaks the connection between the rider's seat (connected gymnastically to the horse's haunches) and the horse's mouth. When this connection is broken, there can be no transmission of the power generated by the hind-legs through the horse's body and into the contact via the longitudinal stretch. This transmission is the real goal of dressage. 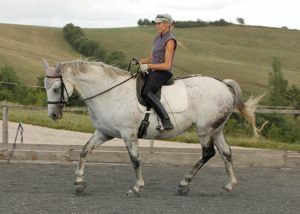 It is this, and only this, that transforms riding into a beautiful and sublime experience for both horse and rider. In the same vein, the dramatic blocking of the horse in front, and over-flexion of the horse's neck involved in the rollkur technique completely eliminate any possibility for the horse to rotate (or tuck) his pelvis, thus making it impossible for him to bring his hind-legs further under his body - where they need to be to bring the horse/rider dynamic into balance. This is why, if you study pictures of horse's being ridden in rollkur, you will usually see the hindlegs flailing uselessly out behind. Again this is the antithesis of correct engagement. The rider seeking engagement needs to perpetually 'open the door' for the horse in front, to encourage the movement to flow through from the hind-quarters. 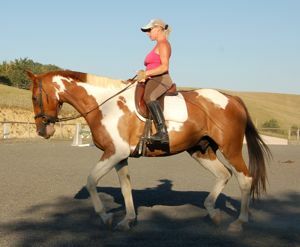 A skilled rider can do this at the same time as maintaining the correct positioning of the horse's head and neck onto the bend (see: The Independent Seat). In order to keep the door open in this way, however, the rider needs to be able to deal with the unbalanced forces of the horse's natural way of moving, and bring these forces into balance with their body (posture and aiding) before these imbalances ever reach the bit. 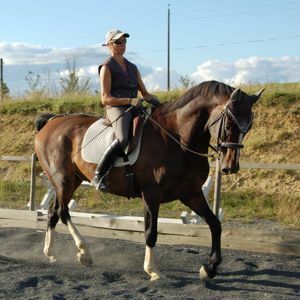 This takes a specific, concentrated postural development of the rider, a process that simply does not take place with the majority of dressage riders, too concerned with finding the quickest way to competition success. Which Head Carriage Is Correct? 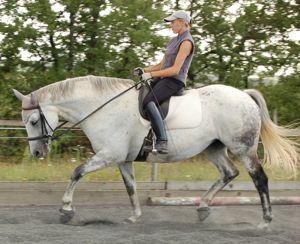 Riding in this way - truly connected posturally to the hind-leg propulsion of the movement, and allowing in the hand - means that there are no rules for the 'correct' head carriage. 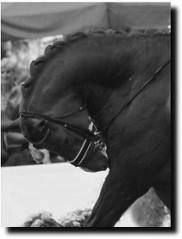 It entirely depends on the individual horse's conformation, strength in engagement, and other possible factors. This is why there can be no such thing as a particular school of thought advising a certain neck position, whether it be rollkur, long and low, poll the highest point, and so on. 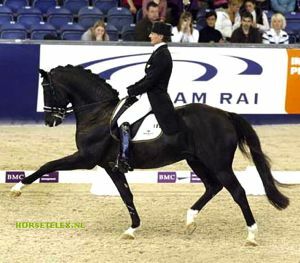 Many opponents of rollkur believe that the poll should be the highest point of the horse's neck, and that the head should not come behind the vertical, indeed these are FEI requirements in dressage. However, when a young horse engages in his early schooling, often he offers a low and rounded head carriage where the poll is not the highest point, and his head may come behind the vertical (see photo, right). This is not necessarily incorrect - if the horse is correctly engaged then by definition, he will be stretching forwards into the contact and softening voluntarily his jaw onto the bit. Such a horse simply doesn't yet have the postural strength to lift his whole body up onto a higher frame, with the corresponding tucking of his pelvis that cantilevers the neck upwards. Most horses, with the progression of their training, gradually come higher in their neck position, but, again, we cannot force this to happen according to some predetermined requirement for certain time periods and levels of training. The gradual raising of the head carriage comes about as a direct result of the horse's increased tucking of his pelvis from growing strength of the 'ring' muscles of engagement. 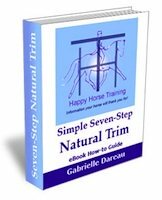 Some horses may take much longer to accomplish this than others, and often basic conformation plays a large role in how easy it is for a particular horse to transform gymnastically in this way. Often a horse will offer significantly different neck positions during the course of one schooling session, again depending on the degree of engagement achieved, and on the type of work being asked for. For example, here (right) is the same horse as in the photo above, during the same session, showing a much higher head carriage, because here in the more collected work she was able to maintain a more tucked pelvis than she could in the more lengthened trot above. A horse who is avoiding engagement by being above the bit is, in terms of engagement, just as incorrect as one who is held down as in rollkur, however this hollow position is at least more 'natural', and the horse is more able to protect his spinal column by contracting the surrounding muscles. This is, of course, not as healthy or as strong a way for the horse to carry a rider, but it is unlikely to do the same kind of profound physical and psychological damage as rollkur. It is therefore far preferable to accept, in your training method, periods where the horse may hollow and lift his head above the bit (photo, right) than to enforce some kind of artificial consistency by over-rounding the horse's neck with the bit. Of course, during these moments the rider is always trying to find the way back to engagement through correcting the posture and aiding. 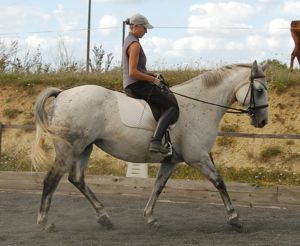 The bottom line is that the natural rounding of the neck and softening of the jaw that goes along with correct engagement comes as a result of the rider's correct use of the seat to encourage the tucking of the horse's pelvis, and the straightening effect of the correct posture and aiding. This is all the rider needs to concern himself with. What happens in the neck and jaw of the horse is a product of all of this, not any kind of means in itself. You Don't Need to be an Expert in Biomechanics, JUST USE YOUR INTUITION! Although the work of those who have set out to prove irrefutably the damaging effects of rollkur is commendable, any rider or trainer who has a modicum of sensitivity and awareness of the horse should not need this to know that such a technique is absolutely wrong! 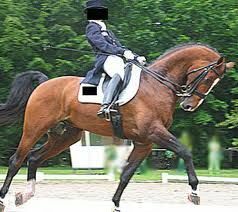 Everything should tell the rider who undertakes rollkur that it is a severe infringement of the horse's boundaries (see Abused Horses for more on boundaries) and that it totally inhibits the precious hind-leg transmission that is the ever-lasting goal of real dressage. Good rider intuition and awareness, however, only come with the right basic intention about what we are trying to achieve in our riding. This is a point we come back to often on the pages of Happy Horse Training, and this is because your intention, in everything you do with a horse, is the foundation on which everything else is built. It will therefore form not only your perception of what is going on, but also the actual experiences that you encounter. Such an abusive and incorrect training practice as rollkur has come about because the intention of certain riders and trainers has became so centered on the ego-driven goal of competitive success. As a result of this faulty intention, these individuals are probably no longer even aware of the physical and psychological damage they are doing, nor the amount they are distancing their riding from what is gymnastically correct. The very nature of competition encourages the ruthless pursuit of victory. Unfortunately the fact that in dressage it is possible to create a completely false presentation that seemingly corresponds to the well-founded regulations, means that the welfare of the horse is sidelined. The desire for the ever-more impressive spectacle, in judges, spectators and riders, has led what is at root a pure gymnastic and artistic discipline into becoming an ugly parody. Anyone who has a fundamentally loving intention towards the horses they work with could never consider using such a technique as rollkur, because they would know instinctively that it was a violation, without the need for any involved explanations and bio-mechanical reasoning. When our intention in riding is to create a profound gymnastic and conscious connection with the horse, this will lead us in the direction that brings about true balance, harmony, and a development of the horse that is ultimately healing, instead of breaking him down. This path may not bring us the greatest recognition, but instead a personal success, shared with the horse, which is so much more rewarding. It is only when we let go of the need to fabricate an artificial appearance, that we open the door to creating something truly beautiful. Lets hope that popular dressage will one day find its way back to this. The correct longitudinal stretch on a loose rein, one of the most important verifications of work in true engagement.